By Terry Dunn on Feb. 11, 2015 at 8 a.m.
Few engines throughout history have achieved a near mythical status among its admirers. Fewer still can share credit for the rescue of an entire nation. Perhaps only the Rolls-Royce Merlin engine can claim both distinctions. This is its story. Few engines throughout history have achieved a near mythical status among its admirers. Fewer still can share credit for the rescue of an entire nation. Perhaps only the Rolls-Royce Merlin engine can claim both distinctions. 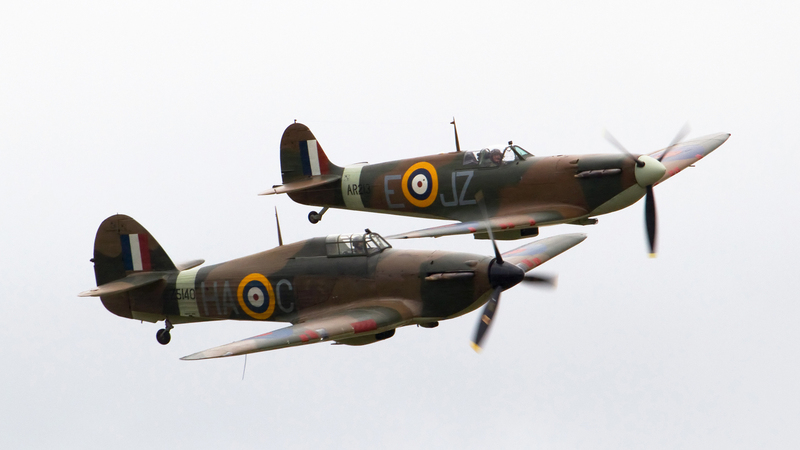 During the Battle of Britain, it was the Merlin that powered the Royal Air Force Hurricanes and Spitfires that were England’s only effective defense against German air attacks. With the battle won, and the engine’s reputation thus established, the Merlin would become the stuff of legend and the powerplant of choice for numerous other aircraft. Even before the 1940 air battles over England, it was apparent that demand for the Merlin was far outpacing Rolls-Royce’s ability to produce them. The Ford Motor Company was asked to build 9,000 Merlins for both England and the US. Ford initially accepted the deal, but later reneged. Henry Ford explained that he would only produce military items for US defense. Interestingly, Ford of Britain in Manchester, England ultimately produced 36,000 Merlin engines, beginning at the same time period. Of course, Ford’s American factories would indeed become vital to the war effort. They manufactured unfathomable quantities of airplanes, jeeps and other war materiel--but not Merlins. Following Ford’s refusal to build the Merlin, a similar deal was presented to the Packard Motor Car Company. At that time, Packard automobiles were considered the “Rolls-Royce of America” by virtue of their luxury and quality. The company also had experience producing airplane engines and large V-12 powerplants used in speedy PT Boats. Packard accepted the offer from Rolls-Royce and earnestly began preparations to build Merlins at their Detroit factory. There are many obvious challenges posed by producing a British-designed engine in America. Just the task of converting all of the measurements from metric imperial to US Standard units was daunting enough. This job was made even more difficult by the unprecedented complexity of the Merlin. 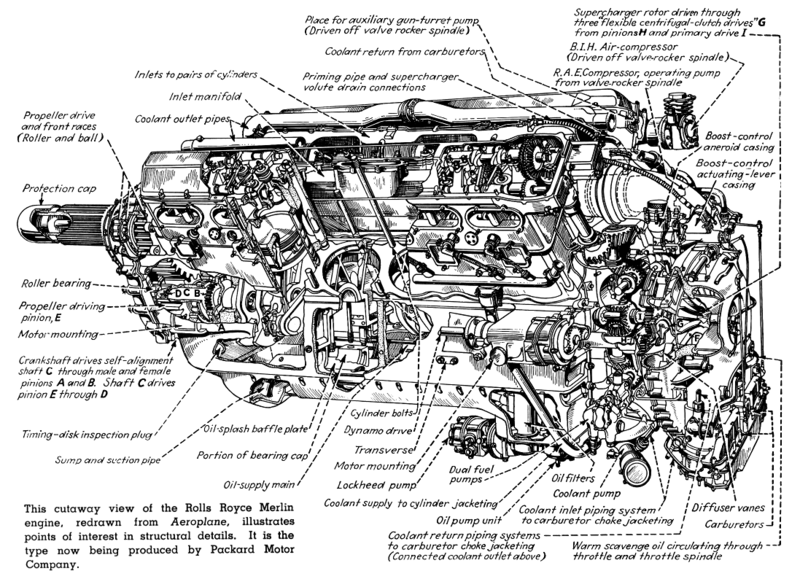 The 1,649 cubic inch V-12 engine is comprised of more than 14,000 individual parts (knoll that!). It was, and still is, often called “a watchmaker’s nightmare. Engineers at Packard soon discovered that Rolls-Royce did not design the Merlin for mass-production. The manufacturing tolerances were much looser than Packard’s standards. This was because Rolls-Royce had never implemented mass-production techniques to their assembly lines. Rather, they employed highly-trained “fitters” to assemble the engines. The fitters filed or otherwise massaged individual parts to achieve a precise fit. They even tightened critical bolts by trained feel, rather than with calibrated torque wrenches. In effect, each Rolls-Royce-manufactured Merlin was a hand-built engine that reflected the company’s traditions of premium quality and craftsmanship. Like Ford, Packard was obligated to redraw all of the Merlin blueprints to satisfy their own manufacturing requirements. This effort took the better part of a year to complete and was closely coordinated with Rolls-Royce emissaries in Detroit. 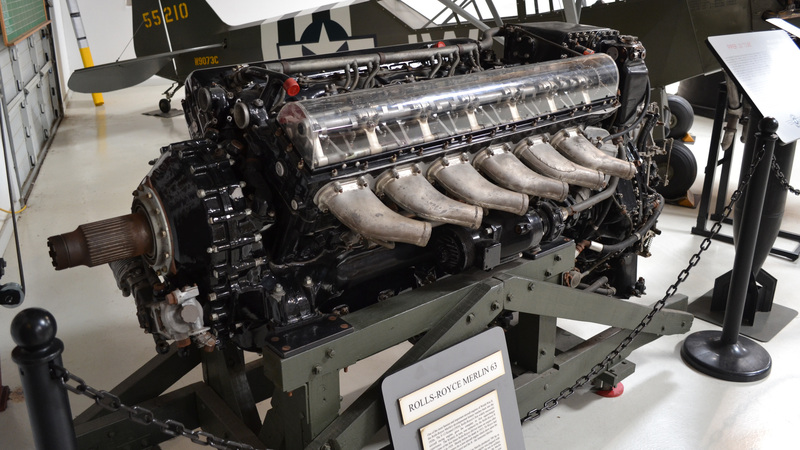 During the time that Packard was gearing up for production, Rolls-Royce was making continuous improvements to the Merlin based on feedback from the front lines. These updates also had to be incorporated into Packard’s operation. This continual two-way exchange of data took a heavy toll on the men tasked to manage it. Of the two original Rolls-Royce liaisons at Packard, one died during his tenure in Detroit and the other perished soon after his return to England. 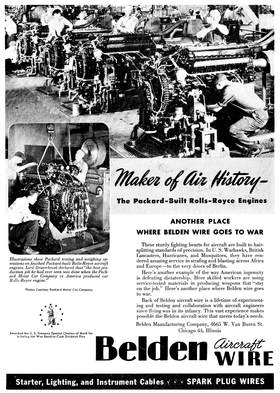 BELDIN MANUFACTURING COMPANY WAS ONE OF MANY DOMESTIC VENDORS THAT PROVIDED ITEMS TO PACKARD FOR MERLIN PRODUCTION. Packard’s licensing agreement prevented them from implementing any changes to the design of the Merlin without approval from Rolls-Royce. There was an understandable need to maintain compatibility and consistent performance among the engines regardless of where they were manufactured. While Rolls-Royce engineers were typically attentive to suggestions from their manufacturing partners, any accepted design changes were applied across all production lines. One area where the Americans contributed to the greatness of the Merlin was the crankshaft bearings. US aircraft engine manufacturers had determined that a silver-lead alloy with indium plating provided long wear and exceptional corrosion resistance. Thankfully, German engineers who evaluated captured American engines falsely deduced that the indium was merely an impurity. Packard shared the secret bearing formula with Rolls-Royce who incorporated it into the Merlin. The Merlin became somewhat further Americanized by the components that were attached to Packard-built units. Carburetors, magnetos, spark plugs, and similar items were sourced through American vendors and sub-contractors, although they were still manufactured to British specifications. To maintain compatibility, Packard did not convert any of the bolts, nuts, and studs to SAE dimensions. Rather, they were obligated to use fasteners with Whitworth threads, as specified by Rolls-Royce. Whitworth-form hardware proved impossible to source within the US, so Packard eventually produced all of the necessary fasteners in-house. The first Packard-built Merlins emerged in August of 1941. As would be expected, there were a few teething problems such as excessive cylinder blow-by and oil leakage. Most historians agree that Packard and Rolls-Royce tackled the issues with a high degree of cooperation. The US-built engines soon performed on par with their English doppelgangers. Packard would ultimately manufacture 55,000 of the 150,000 Merlins that were built. Most of the Merlins built by Packard would find their way into P-51 Mustangs. This American fighter had an uninspiring start, mostly due to the poor high-altitude performance of its Allison V-1710 engine. Once mated to the Merlin, however, the P-51 would be considered among the best aircraft of the war. The exceptional high altitude performance of the Merlin was due to its two-stage, two-speed supercharger (a development introduced in 1941). This complex device allowed the Merlin to produce the same output power (about 1300 horsepower) whether it was on the ground or in the rarefied air at 30,000+ feet of altitude. Comparable single-stage superchargers of the time often peaked at less than 20,000 feet. The exceptional high altitude performance of the Merlin was due to its two-stage, two-speed supercharger. A supercharger works by compressing the fuel/air mixture from the carburetor to sea-level pressure (or higher). So even when the air gets thin, the engine receives the same mass of fuel and oxygen to burn. The Ideal Gas Law tells us that when you compress a gas, you also heat it. The Merlin’s two-stage supercharger actually compresses it twice. If left unchecked, heat from the extreme compression would cause poor performance and/or premature detonation of the volatile mixture. To address this, the Merlin uses an independent liquid cooling system to chill the fuel/air mixture following each stage of compression. The additional complexity of this intercooler/aftercooler system is far outweighed by the performance gains it provides. Any mention of the Packard Merlin near an airport hangar or an internet forum is bound to instigate at least one of two worn out comparisons: the Rolls-Royce-built Merlin versus the Packard version, and the Merlin versus the Allison V-1710. The comparisons of Rolls-Royce and Packard are typically rooted in national pride and false assumptions. As mentioned earlier, there was a tremendous effort by Rolls-Royce, Packard, and Ford of Britain, to make the Merlin fleet homogenous. Although each manufacturer may have employed unique production techniques, every engine had to meet the same specifications, and prove so on the test stand. The problem with most arguments touting the superiority of either manufacturer is that any supporting data typically compares different versions of the Merlin…of which there were many. The same basic engine that made 1,000 horsepower in 1939 (with a single-stage supercharger), was capable of more than 2,000 horsepower by the end of the war just six years later. Additionally, the Merlin was produced for several different types of aircraft (fighters, bombers, & airliners) with specific gearing and supercharger configurations for each type. Apples-to-apples comparisons are difficult to come by. That the Merlin outperformed the Allison at high altitude is hardly a condemnation of the American-designed engine. In its element (up to about 15,000 feet), the V-1710 was robust and reliable – utilizing fewer than half the number of parts found in a Merlin. It was also extremely adaptable to different configurations of gearing, rotation direction, accessories, etc. The Allison engine is a showpiece of modular design. The lack of an adequate supercharger for the V-1710 was a reflection of the requirements put forth by the US military. During development of the engine, the US Army Air Corps decreed than any high altitude versions would be turbocharged (where the compressor is driven by the engine’s exhaust gases) rather than supercharged (where the compressor is driven mechanically by the engine). Both boost types were still relatively new for airplane engines and the turbocharger appeared to offer better efficiency. In practice, turbochargers require substantial large-diameter ductwork and parts capable of operating at very high temperatures. This overhead precluded turbocharger installation in most Allison-equipped fighters. They received engines with a single-stage supercharger, and the resulting altitude limitations. The one notable exception was the Lockheed P-38, a twin-engine bird that was large enough to accommodate the turbochargers. The P-38’s enjoyed widespread success in the Pacific theater, but even the turbocharged Allison proved troublesome for high-altitude flying over Europe. This was partly due to improper engine management techniques that were initially taught to P-38 pilots. Yet, it remains clear that the V-1710 was never suitably developed for high-altitude operation. In the post-war years, many Merlin-equipped aircraft (and spare engines) were retired from militaries and sold to private buyers. Many of these airplanes and their Merlins were modified for maximum speed in the air racing boom that followed the war. Owners found that you could coax considerably more power out of the engine (3000+ horsepower) at the expense of longevity. For a while, surplus Merlins were also a popular powerplant for racing boats. 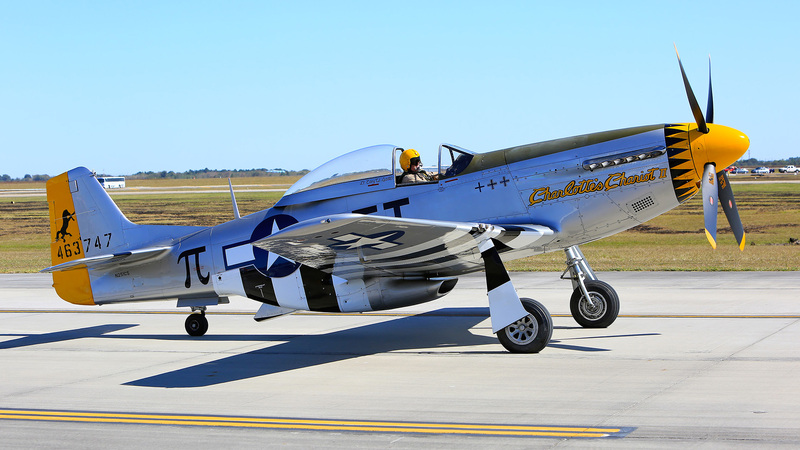 Even today, you can hear the distinct song of a Merlin in one of the privately-owned P-51s that remain airworthy. These steeds are still popular mounts for air racers and (well-heeled) private pilots. Although much less plentiful, other Merlin-powered warbirds can also be found throughout the world. After WWII, Packard resumed making consumer automobiles, albeit with a loosened focus on luxury. Like other automobile manufacturers, Packard often struggled in the competitive post-war car market. By the late 1950’s, Packard had merged with Studebaker and would soon disappear altogether. Although the company is now long gone, it seems that the Merlin engines that Packard produced will continue running for quite some time.